A 2,500-acre property loved for its existing hiking and equestrian trails with panoramic views, El Capitan Ranch was conveyed to California's Department of Parks and Recreation for management as public open space and wildlife habitat. TPL was able to permanently protect the ranch at the end of 2002, nearly doubling state park land on California's Gaviota coast. An exceptional opportunity to connect the beach to the mountains, protection of the ranch created 11 miles of public trails stretching from El Capitan State Beach to the Los Padres National Forest. 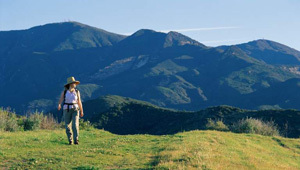 Leading visitors through various climates and habitats, the trail rises from the beach to the Santa Ynez Mountains, revealing stunning vistas at every turn.